The year is half over already?! Well, hell. Suppose we should argue over the best the genre has had to offer thus far? Senior Filmmaking Correspondent Jason Tastevin joins us to debate whether 10 Cloverfield Lane is a horror film or not, whether The Witch is any good, and to count down the best in horror so far this year. Successful anthology horror is difficult to pull off. Southbound manages to do so as it spins its diabolical tale, interlocking five stories of travelers on a particularly lonesome road. The film opens strong as two bloodied passengers rush to a desolate gas station to clean up and take stock of their situation – a situation we’re given very few clues about. But the immediately menacing, we-know-something-you-don’t-know atmosphere inside that gas station sets us up for the nightmarish episode that will unravel. What follows are pieces on similarly distressed wayfarers – a rock trio with a flat tire, a distracted driver, a brother searching desperately for his missing sister, a family on an ill-planned vacation, then back to the original bloodied pair heading for gas. Rather than feeling like five shorts slapped together with a contrived framing device, the segments work as a group to inform a larger idea – together they help to define this particular and peculiar stretch of highway. Brothers Ben and Chris Blaine crafted their feature debut as a “fucked-up fairy tale.” The truth is, that tag line sells their bleakly comedic, emotionally relevant, disquietingly familiar film short. Though you may laugh, Nina Forever swims a wellspring of sadness. Check out girl Holly (Abigail Hardingham, wonderful) falls hard for mopey, over-aged stock boy Rob (Cian Barry), who’s still suicidal over the motoring death of his longtime girlfriend Nina (Fiona O’Shaughnessy). Whenever the two living lovers hook up, Rob’s viscera-and-glass-shard-covered ex writhes her way into their embrace. As an analogy for those awkward relationships you just can’t seem to let go of, Nina Forever excels in its amplification of all that is awkward and unruly. The filmmaking duo, who also write, avoid clichés and easy answers while their talented cast creates unpredictable and dimensional characters. There is real depth and authenticity to a film that constantly surprises without really feeling contrived. Few seasoned directors handle tonal shifts with as much confidence as the Blaines in their feature debut. If you’ve ever wondered what hell might look like, first time feature director Can Evrenol has some ideas to share. They are vivid. You’ll swear they even have an odor. Evrenol’s Baskin is a loose, dreamily structured descent into that netherworld in the company of a 5-man Turkish police unit. (Baskin is Turkish for “police raid.”) The serpentine sequencing of events evokes a dream logic that gives the film an inescapable atmosphere of dread. We are trapped along with this group of somewhat detestable, somewhat sympathetic men as they respond to a call for backup in an “off the map” nearby area. What they find is deeply disturbing. Evrenol’s imagery is morbidly amazing. Much of it only glimpsed, most of it left unarticulated, but all of it becomes that much more disturbing for its lack of clarity. There are moments when Baskin feels like a classier, more stylishly made Nightbreed, but there’s no camp factor here. Just a surreal exploration of the corruptibility of the human soul, and its final destination. As he did with Blue Ruin, writer/director Jeremy Saulnier plunges unprepared characters into a world of casual savagery, finding out just what they have to offer in a nasty backwoods standoff. It’s a path worn by Straw Dogs, Deliverance, and plenty more, but Saulnier again shows a knack for establishing his own thoughtful thumbprint. 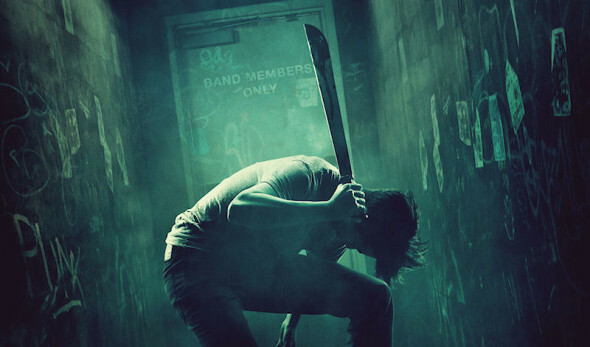 What Green Room lacks in depth, it makes up in commitment to genre. Only a flirtation with contrivance keeps Green Room from classic status. It’s lean, mean, loud and grisly, and a ton of bloody fun. The unerring authenticity of The Witch makes it the most unnerving horror film in years. Ideas of gender inequality, sexual awakening, slavish devotion to dogma, isolationism and radicalization roil beneath the surface of the film, yet the tale itself is deceptively simple. One family, fresh off the boat from England in 1630 and expelled from their puritanical village, sets up house and farm in a clearing near a wood. As a series of grim catastrophes befalls the family, members turn on members with ever-heightening hysteria. The Witch creates an atmosphere of the most intimate and unpleasant tension, a sense of anxiety that builds relentlessly and traps you along with this helpless, miserable family. As frenzy and paranoia feed on ignorance and helplessness, tensions balloon to bursting. You are trapped as they are trapped in this inescapable mess, where man’s overanxious attempt to purge himself absolutely of his capacity for sin only opens him up to the true evil lurking, as it always is, in the woods.